With financial spread betting, you can profit whichever way the markets are moving - rising or falling. In this lesson, you will find out how financial spread betting works at Victor Chandler and why it is so attractive to investors. ** What is financial spread betting? In simple terms, financial spread betting is a system that enables you to profit from movement in a share price without actually buying the share. You don't have to own any shares in a company to profit from movement in its share price. Correctly forecasting the direction in which you think the price will move is the important thing, because you are relying on your judgment that the price will either rise or fall in value in the future. If your forecast is correct, you profit. If not, you make a loss. The major attraction of financial spread betting is that you can profit from a falling price in the same way as from a rising one - and you can achieve this with a relatively small amount of money. *** In financial spread betting, what markets can I trade? With VC Financials, there are hundreds of different trades available to you. *** Who is financial spread betting for? *** How does financial spread betting work in practice? To illustrate how financial spread betting works, let's take a simple example. You first select a 'contract'. This is the word VC Financials uses to describe each trade it offers to investors. An example is Anglo Irish Bank - Jun 2008. You select a contract, the quoted price of which you think will either rise or fall over a certain period in the future. 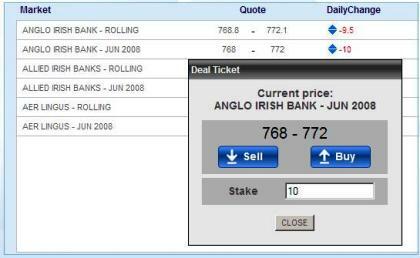 Let's imagine it is April 15 and you are interested in placing a spread bet on the Anglo Irish Bank - Jun 2008 contract. You start by checking the ‘price’ VC Financials is quoting for the share, either online or by phone to a VC Financials trader. The quote reflects the actual share price and is 768 - 772. The quote consists of two figures - the 'sell' and the 'buy' price. The sell price is the lower of the two and is quoted first. The difference between the two figures quoted is the 'spread'. You will learn more about this later. You must decide whether you think that the price of Anglo Irish Bank shares will go higher than the high VC Financials figure (the 'buy' price) or lower than the low figure (the 'sell' price). If you think the price is going to rise above the higher price, you 'buy'. Buying is also known as 'going long'. If you think the price is going to drop below the lower price, you 'sell'. Selling is also known as 'going short'. Confirming your intention to either buy or sell is known as 'opening a trade' or 'opening a position'. *** What is a stake? When you place a spread bet, you agree a certain sum of money per point movement in the price of your selected share. This agreed sum is known as the stake. It is the amount you stand to gain or lose for every point the share price moves up or down. 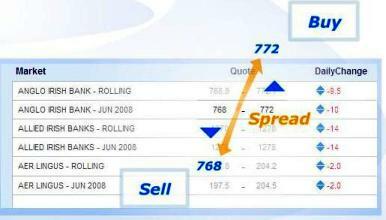 The size of a spread bet is expressed in terms of point movement. So, for example, you might stake £10 for every point movement in the price of Anglo Irish Bank shares or for every point movement in the value of Wall Street. With VC Financials, your stake can be as little as £1 for every point rise or fall in the share price you have selected to trade. You can vary your stake each time you open a new trade and the stake you select will also apply when you close that trade. *** How much do I need to deposit with VC Financials? In financial spread betting, you do not have to pay the full cost of the share prices you are trading. You must, however, have sufficient funds in your account to cover any potential losses. This is known as 'trading on margin'. How do you know how much money you need to open a position? For each contract, VC Financials calculates and quotes a figure known as the initial margin required (IMR). You can check this figure by clicking the Info icon associated with each contract. To calculate your deposit for each trade you wish to open, you multiply the IMR by your stake. So, for example, if the IMR is 50 and you wish to do a trade of £5 per point, you would require a minimum of £250 in your account to open a new position. When you buy to open a trade, you must buy at the higher price. When you close that trade, you must sell at the lower price being quoted at the time you want to close. Equally, when you open a trade by selling, you must sell at the lower price, and when you decide to close that trade, you must buy at the higher price being quoted on the day you decide to close. *** When can I close a trade? You can close a trade at any time, whether you are making a profit or a loss. This level of control is one of the advantages of financial spread betting. It is not important that your selection should achieve exactly any specific price on a specific date in the future. The important thing for you is that the unit price behaves in the way you had forecast at the time you opened your position, and exceeds or falls below the price quoted in line with your forecast. Financial spread betting is a system that enables you to profit from movement in a share price without actually buying the share. You act on your judgment on the direction in which you think a share price will move. You can profit from a falling market in the same way as from a rising one - with a relatively small amount of money. VC Financials offers hundreds of different markets for you to trade - shares, stock market indices, commodities, currencies, bonds and interest rates. In financial spread betting, you are quoted two prices for each trade - you 'sell' at the lower price and 'buy' at the higher. The 'sell' price is always quoted first. You buy if you think a price will rise and sell if you think it will fall. Victor Chandler Financials (VCF) will refund net losses incurred by new clients in their first eight weeks. Go to Financials Section !!! "Spread Betting Tutorial - Lesson 1: Overview"